This is the first of what I hope to be a somewhat regular personal note to you about yoga. Through something like this I may be able to share on some topics that we might not cover in quite the same way in a yoga class. I would love to hear any views or reactions you might have as a result of reading this. Many of us come to yoga classes with the intent to gain strength, improve flexibility and range of motion, improve balance, and improve our sense of health and well-being. We may have objectives of fitness, emotional stability, stress-reduction, or all of the above. Or we may come to yoga out of simple curiosity. But yoga differs from sports and exercise regimens because it is fundamentally a discipline of the mind with a capacity to take us very deep. Sutra I.2 states yogah cittavrtti nirodhah, which B.K.S. Iyengar has translated as "Yoga is the cessation of movements in the consciousness". We can think of thoughts, emotions, and memories as waves rippling across our consciousness. Through the practice of yoga, we begin to smooth out these waves, bringing our mind to a state of focus, and eventually to a state of peace and closer connection with our true selves and the greater whole that surrounds us. As practitioners of yoga, you have surely tasted something akin to this. The feeling of health and exhilaration that we get from yoga is the hook, but the deeper quest is what I believe ends up mattering most over time. The Sanskrit word vrtti means waves, changes, movements, or fluctuations (see Light on the Yoga Sutras of Patanjali, by B.K.S. Iyengar). Yoga may be a quest to restrain the waves in our consciousness, but these waves also form the reality of our day-to-day lives: our joys, sorrows, ideas, dreams, goals, plans, and memories. So it may be a bit scary to consider smoothing them out. But we also know there is a peace that comes from separating ourselves from these day-to-day vibrations. The practice of yoga takes us to the edge of fears and longings that may be at odds with one another and moves us to a different place in our experience of life. So though we work through the physical layer while practicing an asana (tighten your knees, press your thighbones back, lengthen your torso, broaden the top chest, etc. ), we know we are on a much deeper path when we hold the pose, focus, and breathe. Some of you may recall from last year that I sent an e-mail with poses that can be done after eating (useful for the holidays :-), so I thought it would be timely to convey this information again. This time, however, let's focus not so much on whether or not we have eaten and the benefits to digestion, but more on how these poses can bring on a calm, relaxed state in which you might get glimpses of stilling the vrtti. 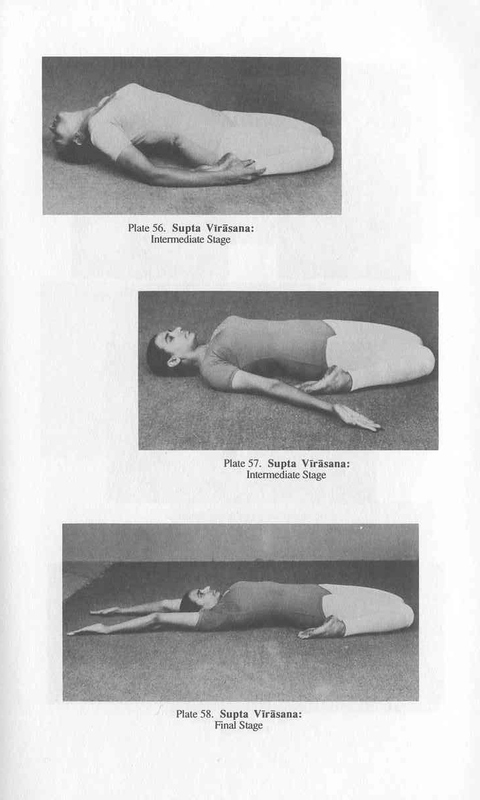 The photos below are from Geeta Iyengar's Yoga - A Gem for Women, and the sketches are from Geeta's Preliminary Course. You are probably familiar with these poses from yoga classes. 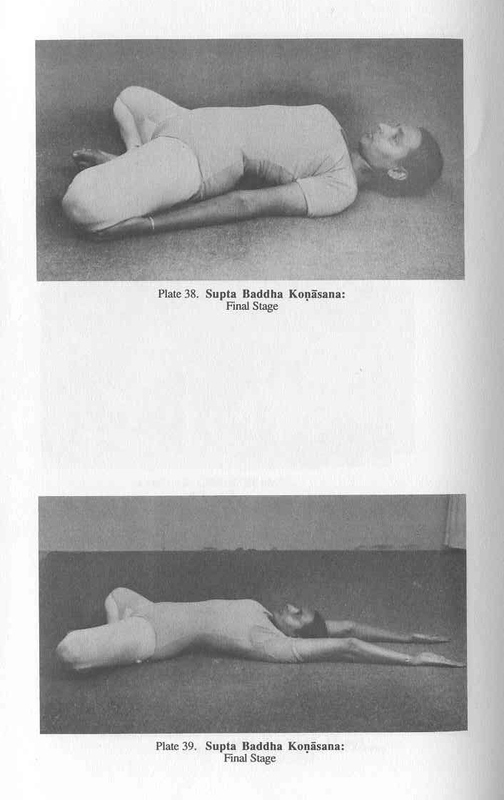 A restorative Supta Baddha Konasana (reclining bound angle pose) is often performed with support of a bolster for the trunk and a folded blanket for the head. A strap is often used around the low back, over the thighs, and around the feet (soles together). A restorative Supta Virasana (reclining hero pose) is often performed with support of a bolster for the trunk and folded blanket for the head. In either pose, arms can be placed near the sides of the torso (palms up), stretched overhead, or overhead clasping opposite elbows. Somewhat playfully, I have entitled this communication Vrtti. I look forward to connecting with you from time to time with assorted vrtti that will hopefully benefit your personal quest!